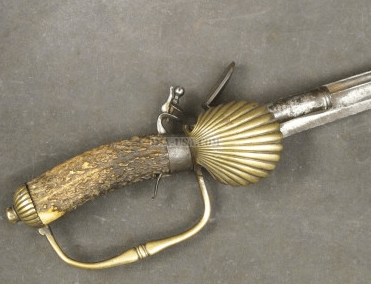 A VERY GOOD/FINE AMERICAN REVOLUTIONARY WAR PERIOD AMERICAN MADE FUSIL BAYONET, ca. 1770s: In overall very good/fine untouched condition. Tapered, triangular-form, 14 3/4″, flat, blade of typical English-inspired/”Brown Bess” form. Marked with a deeply struck crescent-shaped American Blacksmith’s/maker’s mark, on its base. 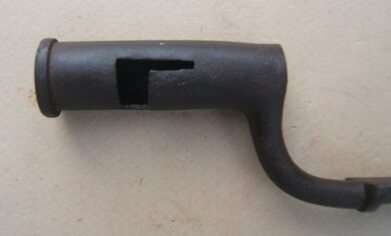 Closed ring, “Brown Bess” type socket (for a top-lug-mounted, approx. .69 caliber barrel) with a “Z” shaped lug-slot. Retains untouched, smooth, brown- steel surfaces with gunmetal highlights, some scattered light discoloration and fine pitting. In overall very good/fine untouched condition with sharp contours and a fine point and socket. 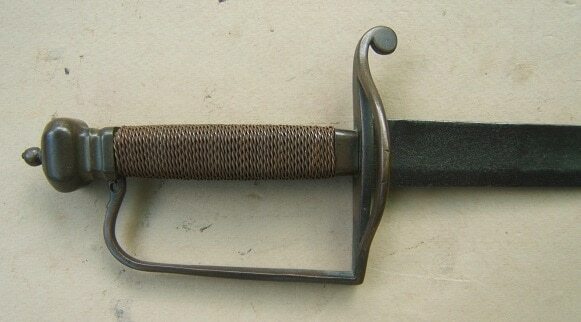 A very nice example of an American Revolutionary War Period American made Fusil type Bayonet, ca. 1770s. Overall length, 19 1/2″.